Joy to the world! The Christmas season is upon us! The most important elements of the mantelscape, of course, are the stockings. The one in the middle was the first of our collection--purchased 19 years ago, when our oldest son was a baby. We added stockings in 1993 and 1997 when our second and third sons were born, and finally bought one for Dad and one for Mom. Now they hang in order on the mantel, where they'll stay until they're filled on Christmas Eve. The greenery on the mantel came from my yard. One of the wonderful things about using greenery is that you can hide any unsightly elements of your mantelscape. My candlesticks and topiaries are elevated on a motley collection of boxes, but those all disappear beneath the beautiful greenery. And the wonderful Christmasy smell of pine and cedar is a welcome bonus! As usual, one of our doggies has curled up in front of the fire for a cozy nap. She'll have to move for Christmas morning, though, because this chair is the favorite spot for boys to open their stockings. I'm joining the beautiful Layla at The Lettered Cottage for her mantel party. Visit Layla to see dozens of beautiful mantelscapes! Richella, love the way you have decorated the mantel. It is beautiful & so traditinal. That is my style ~ I've got to get busy, haven't started decorating yet. Hi, Richella, it's all just beautiful,I love your traditional mantel & colors. The pic with the dog curled up could be right of out Norman Rockwell. Merry Christmas, my friend! 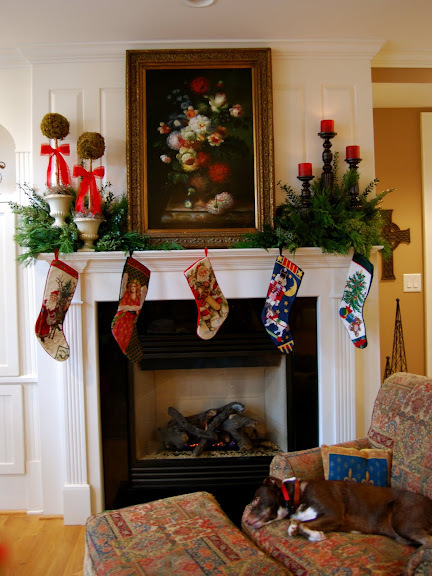 That painting is the perfect inspiration for a christmas mantel! I still have your topiaries bookmarked from last year :) And I love the tall candlesticks with the red candles....beautiful. GORGEOUS! I love the traditional feel of your mantel. Looks like a room straight out of a design book! Richella, it is beautiful. 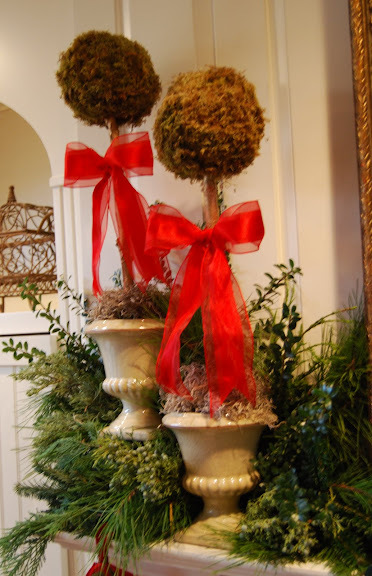 I love the traditional look as you know and yours looks so good with the lush greenery and your pretty topiaries. I don't have enough words. Beautiful, gorgeous, amazing......love it!! Your mantel is just lovely! I especially love the greenery and I think the dog just makes it a perfect picture indeed! Love the moss topiaries! So, so cute! Oh so pretty! Traditional and cozy, and very inviting. What a lovely traditional look! Enjoy the holiday season. Very elegant. This could be in a magazine. Oh, how beautiful! You have such a lovely mantle to work with, and your topiaries and candlesticks are just the perfect complement to that gorgeous painting. Fabulous, I just love it, and your live greenery is the best, and yes you are right can't beat the price! You inspired me so much when I read this earlier today, I went out and found some wonderful greenery in my yard, and finished my mantel. Your mantle is just elegant! I especially love the painting above your fireplace! I'm thinking I need to plant a few more evergreens around my home to have something to cut for the indoors at Christmas! I love the traditional look. So pretty! Your moss topiaries are awesome! I have an empty spot on my mantle and I have been debating about trying to make one. I looked at your link on how to make them. It is completely different than all the other 5,394,874,397 mantles I have seen tonight, LOL! Does puppers even have a red ribbon on her neck? I love the story behind the stockings--my second daughter, 16, is asking for stockings this year--I have NEVER done them- am I a bad mom or what? I pray that you are having a blessed time making your home this Christ-mas time! It's so beautiful Richella! 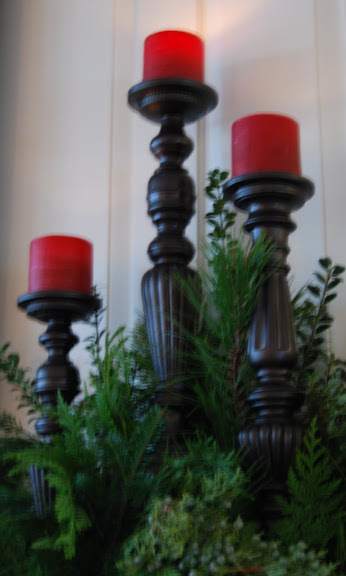 I love the shape of those candlesticks. They're gorgeous! Love the painting too. Very pretty! We have very similar stockings, needlepoint, aren't they? Very pretty! This is absolutely gorgeous! I am trying to use natural greenery and mine just doesn't look nice! Can you tell me how you got yours to look so full? Did you use florist foam or anything? I am just in love with your mantel! So beautiful, Richella! I wish I could come visit and see it in person! That is so pretty. You did such a good job with it. We have some of the same stockings! We have the nutcracker and tree ones. Beautiful! The topiaries are awesome.